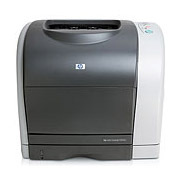 When your workgroup printer is an HP Color LaserJet 2550 printer, you can expect great things. This printer is known for its flawless monochrome print work, its impressive color capabilities, and its customizable features that can be tailored to meet your business’s needs. It’s got an impressive print speed of 19 pages per minute (ppm) in black and 4 ppm in color, and if your office requires greater print volumes than previously anticipated you can swap out the factory standard paper tray for one that holds 250 sheets or 500 sheets. This model even has a straight paper feed option to make it easy on you when you’re printing on thicker, heavy-stock paper. You trust your sturdy printer to produce great work, but that requires high-quality Color LaserJet 2550 toner. While original equipment manufacturer (OEM) HP toner cartridges are known for their quality, they’re also known for their high OEM prices. 1ink.com’s remanufactured HP 122A toner cartridges will give you the sharp features and true color fidelity that you depend on, all while helping you save over 50% off the OEM price!